For a long time allotment gardening was widely seen as the preserve of older men in flat caps (remember Arthur and his allotment in Eastenders? ), as a place to potter about and sit in their sheds. 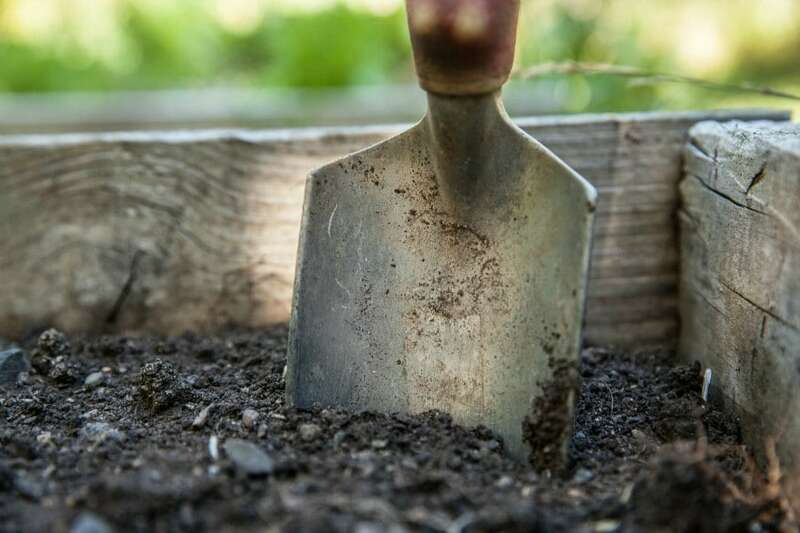 However, as food prices continue to grow higher and higher, and more and more modern housing developments are created without any private gardens, more and more people are getting in to allotment gardening. Allotment gardening is a great and cheap way to have access to your own plot of land for growing fruit and vegetables (approximately £50 a year for a standard sized plot); the allotment community is friendly and sociable and keen to share knowledge and swap seeds; and it’s a relaxing and fairly stress-free hobby (as long as slugs don’t attack!). 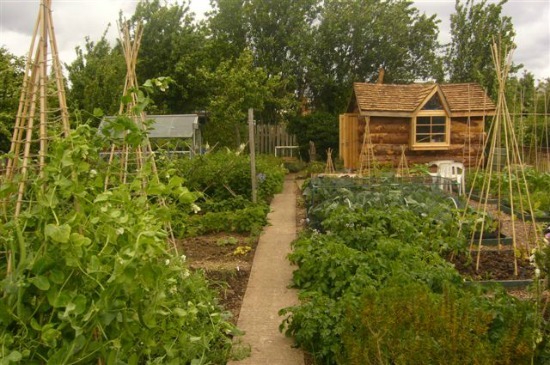 It seems that with a bit of planning and forethought allotments can look good as well as being practical (although it does help if you have some stellar carpentry skills to create that shed!). Whilst browsing the internet, it also struck me that developers are cottoning on to the fact that people want access to garden space. 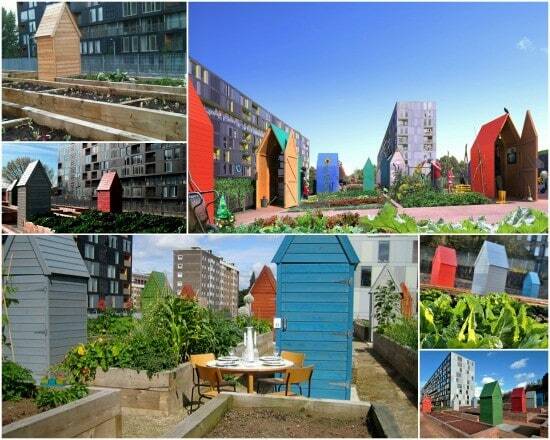 These modern allotments at Saxton in Leeds are a great example of developers incorporating allotments into modern flat developments. Although the plots are small there is still plenty scope for growing a variety of different vegetables, and I have the say the multi-colour sheds are very aesthetically pleasing. Who wouldn’t want to be out at their allotment on a gloriously sunny day? I know they aren’t the biggest of plots, but it’s given me all sorts of allotment ideas – a brightly coloured shed and some raised beds for starters! All fired up and wanting your very own allotment? The best bet is to contact your local council, however the National Allotment Society may also be a useful port of call. However, I’m not wanting to burst your bubble, but in case you weren’t aware, there is a terrible problem of supply and demand, in that there are often huge waiting lists for allotment spaces. In some parts of Edinburgh alone there are 9 year waiting lists, and sadly, from what I am aware of, the Council is doing very little to help free up more land for allotments. In many places up and down the country allotments have even been sold off to developers. You might be wondering what you can do about this? There is an online petition that you can sign that calls for the Government to introduce and implement a new allotment strategy to help improve the current provision and increase the number of allotments available to meet demand. You can sign it here – it’s open until 18th January 2014 and needs at least 20,000 signatures so please spread the word. I have heard of some areas of the country where there are allotments ready and waiting for occupiers, so it may be that you are one of the lucky few, but in any case, sign the petition for all of us less privileged!